I really hate the favorite bird question. No one wants to hear the old standby answer, "the one I just saw," no matter how accurate that is. I truly do not have a clear favorite, but there a few birds that always get mentioned when I'm forced to name something. Black-necked Stilts always make the short list. I'm not even certain why I like them so much. It's clear that I have a thing for black and white birds. The Black-and-white Warbler has long been my favorite wood warbler, the Swallowtail Kite my favorite Raptor, and the Crab Plover my ultimate grail bird. 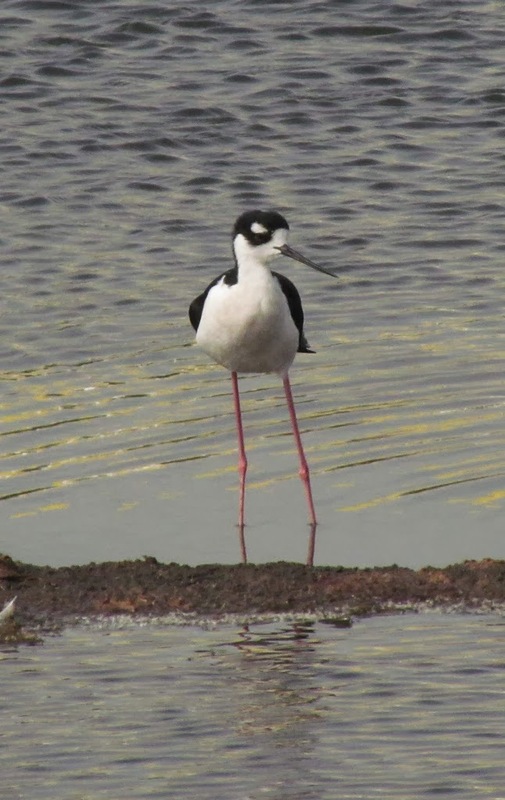 Black-necked Stilts are not only black and white, they're a black and white bird stuck on top of absurdly long bright pink legs. They are really ridiculous looking. Normally I prefer birds with unique feeding adaptions or specialties, but these birds are generalists. Anything small and aquatic is fair game. It must just be how weird they look that I fancy. They also get high marks for being very good to me. I've managed to see Black-necked Stilts in five different states now, two of which aren't in their normal range. My lifer was west of Long Lake National Wildlife Refuge in North Dakota in June of 2012. They don't show up often in North Dakota, but we happened to be at the right place at the right time. The Lifer...love at first sight. Black-necked Stilt at Long Lake Creek, North Dakota. We found them at a few locations late that fall in south Texas, including some up-close and personal looks on South Padre Island. 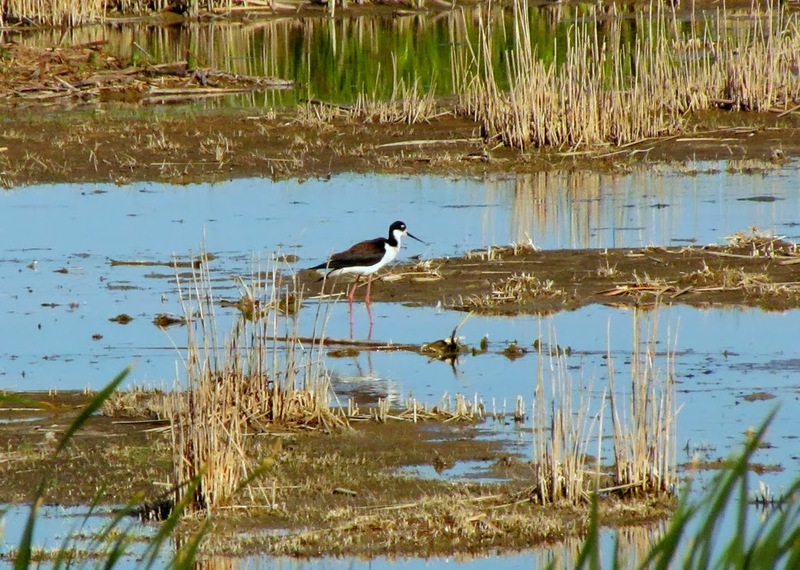 The following summer, we got our home-state Michigan Black-necked Stilts at Shiawassee National Wildlife Refuge where a pair gave every appearance of nesting. They're even rarer here in Michigan than in North Dakota, with these two birds being the eighth state record. Black-necked Stilt admonishing his cohorts, South Padre Island, Texas. Black-necked Stilt, South Padre Island, Texas. 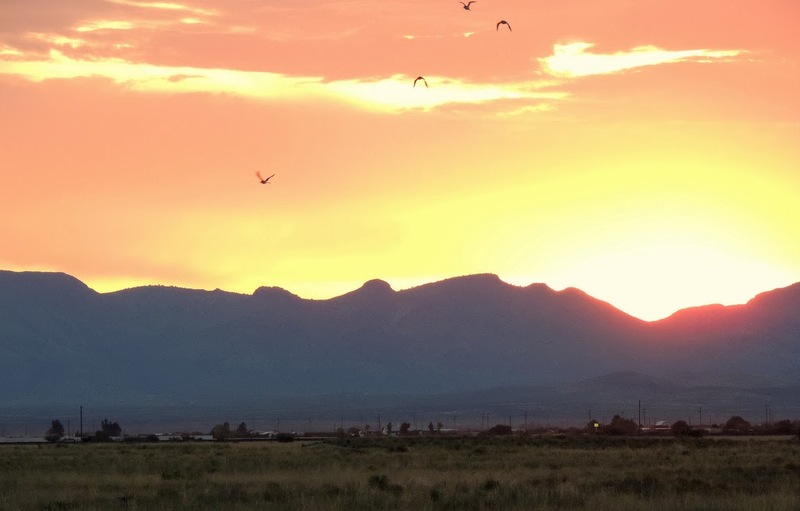 On a balmy August evening in Wilcox, Arizona last summer we got to see some stilts fly in against the backdrop of the sun setting behind the Dragoon Mountains. Black-necked Stilts with sunset behind the Dragoon Mountains (last stronghold of Cochise), Arizona. Black-necked Stilts are on my mind right now because I just returned from Everglades National Park where a flock of them was occupying Eco Pond. Like Cochise Lake in Wilcox, Eco Pond is part of a sewage treatment system. The viewing platform at the pond was wiped out by Hurricanes Katrina and Wilma in 2005, but the pond is still one of the most accessible freshwater birding sites in the Everglades. The stilts were joined by a Roseate Spoonbill, fishing Osprey, a few shorebirds, and some assorted ducks. A circumnavigation of Eco Pond turns up all kinds of songbirds as well. It's really one of the best bird walks in a park overflowing with good bird walks. But on that day last week, I was just happy to see the stilts! Black-necked Stilt, Eco Pond, Everglades National Park, Florida. I think that naming a favourite bird is well nigh impossible. It depends on your mood, the location, and other factors no doubt. BUT....if push came to shove and I had no choice but to select one I think for me it would be Black-capped Chickadee. I was once in northern Ontario clearing the snow off the roof of a summer cottage and the temperature was about minus 20. Suddenly a whole flock of cheerful, chattering chickadees were all around me and that joyful encounter has always remained a very fond memory. You sound like a friend of mine. He grew up in Wisconsin, but has spent the last decade in Florida. His biggest gripe about living there is that the chickadees just aren't right! They are FABUlously stylish birds, for sure. I always thought their name was such a misdirect. Black necks are pretty common, mile long BRILLIANT pink/red legs are not. Super models. Was just at Padre Island & it was CRAZY cold & windy (our drive back to Houston showed ice-covered trees by the highway), but we still saw a row white ibis foraging in front of a row (in the grasses) of sandhill cranes. And stopped to ogle whooping cranes next to the highway. Had a wind-burned face for 3 days, so I'd really like to rtn. when it's not semi-lethal, but what a COOL park. We also visited a sewage pond area near the park and got SO close to many beautiful little ducks, it really was a treat. BTW, if you love B&W (which I'm semi-obsessed w/) how do you feel about smew? I think they're AMAZING & I've never seen one in person. Talk about minimalism! I have yet to see a Smew (and keep my favorite list to seen birds), but when I do, I fully expect it to instantly become my favorite duck, and perhaps one of my favorite birds. the name is just wonderful, as well: SMEW! Great photos of beautiful birds! We saw only Himantopus himantopus, but this species is also very nice. Your blog is very interesting! Thanks, Michał and Piotr! I really want to see H. himantopus someday. And Recurvirostra avosetta, to keep the black and white theme going (and the Recurvirostridae theme!). I see you have both of those in Poland. I will have to bird there sometime! A beautiful bird indeed. I am partial to anything that might be described as being on stilts as I was often accused of the same thing (and occasionally still am). Great story also. I can see your passion runs deep. So far in my novice beginnings to appreciate the birds around me, my favorite would have to be Pileated Woodpecker, if only for the childhood memories of the 80's it invokes. What a gorgeous series of captures....and the reflections!!! It is a real challenge to name a favourite bird. I haven't seen your Black-necked Stilt, but the Black-winged is a favourite with many photographers in Australia as they make great subjects, especially with reflections. Their call is interesting too! Gorgeous shots of this elegant and graceful bird! I'd love to see one in person some day. Have a great weekend! 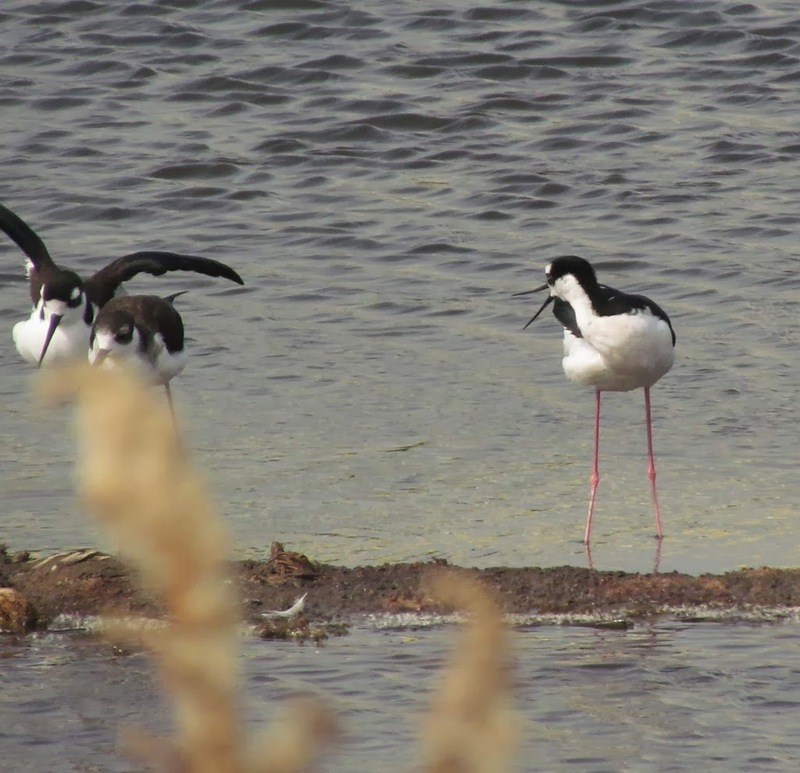 I also saw Black-Necked Stilts at Mitchell Lake in San Antonio. What a beauty! They are a lovely bird and your photos are fantastic! I saw my first Black-necked Stilt on our trip down to Florida, unfortunately not in the wild but in a wild bird rehabilitation center. Such a beautiful little bird. 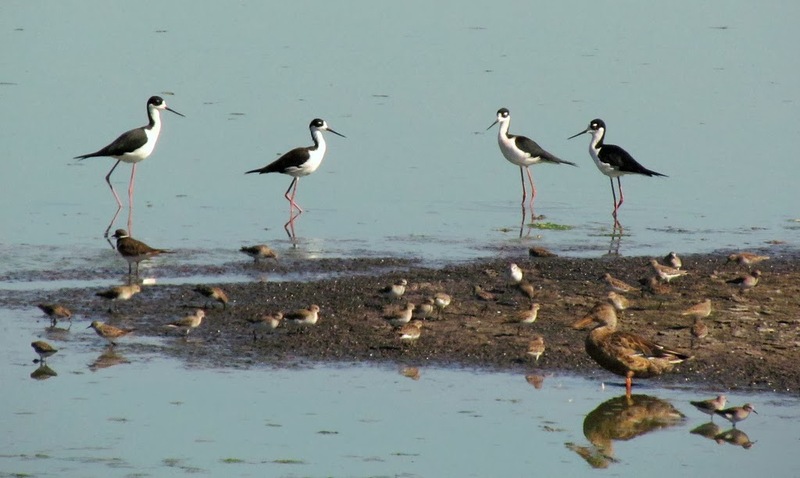 Exquisite images of stilts ! Saw quite a few of them at bird sanctuaries during my recent tour to the State of Gujarat in Western India ! They are indeed beautiful flower. Interesting is their long pink legs.